Have you heard the term “containerization” thrown around a lot recently? It’s a hot topic in the IT world, but what exactly does it mean and how can you prepare your enterprise to take advantage of what it has to offer? Continue reading to learn all about it and the steps your enterprise needs to take to deploy containers in your organization. A solution to the problem of how to get software to run reliably when moved from one computing environment to another. This could be from a developer's laptop to a test environment, from a staging environment into production, and perhaps from a physical machine in a data center to a virtual machine in a private or public cloud. Simply put, containerization allows for an entire software program, including everything it needs to run successfully, to be housed in one unit (container) to avoid errors between different applications, deployments, and systems. It can also be more efficient than virtual machines, as multiple containers can be run on one operating system and with a smaller amount of required space needed–think megabytes compared to gigabytes. Keep reading for part one of a two-part blog series that outlines the steps you need to take to prepare your enterprise for containerization. The first step in implementing containers within your business is understanding that it will alter your organization as a whole. In an already complex environment, containerization will bring with it new complexities and changes within your enterprise beyond just technology; it will include transforming your infrastructure, technology, and development. While change is often seen as a negative, it is not to be feared. The change in your organization from containerization will be positive, allowing for operations that are more efficient. How? Containers allow developers to pack even more applications onto hardware while leveraging the maturity of virtualized infrastructures. This makes implementing containers even easier, as it does not require a significant IT infrastructure and operational change. Due to their very nature of being fast and lightweight, implementing containers saves infrastructure engineering teams time and dollars. Development and software engineering groups can better operate in tandem once they leverage containers and more efficiently streamline the entire deployment process. There must be an overall understanding of why the organization is considering adopting containerization in the first place, along with the perceived benefits they hope will follow. Look to those experienced in this type of transformation for guidance on how to best approach containerization. Since containerization requires a fundamental change in both application development and infrastructure, the decision to adopt it must be based on your full understanding of how it will affect the current and future state of your existing enterprise environment. 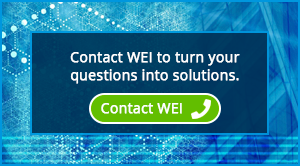 Talk to an IT solutions provider, like WEI, who can provide a comprehensive analysis of your current development environment and infrastructure. We can identify the benefits or any potential pitfalls that could result from a move to containers—and outline the improvements that need to be made to support your decision to move to containers. As you can see, once you make the decision of moving to a containerized environment there are critical steps you need to take to ensure that you’re ready for the transition. In the next segment, we continue this discussion on the process of preparing your enterprise for the move to containers. Still have questions? Click the button below to contact us or check out our comprehensive web page that covers all aspects of containers. David Fafel, Chief Architect, leads WEI’s long-term technology vision, and is responsible for spearheading development of complex solutions, architecture, as well as application development. David engages with our clients to drive technology design across datacenter environments, cloud architecture and IT strategy. David holds several technical certifications from HP, Cisco, IBM and other leading technology innovators.